Blogger, some time ago, explicitly prohibited sale of blogs. Either Blogger will delete the blog as spam - or AdSense will classify it as "MFA". If you buy a blog, "blogspot.com" or custom domain, with content already in place, it will probably contain copyrighted material. If Blogger does not delete / lock it as spam, AdSense will probably classify it as "MFA" - and the blog will never display ads. Blogger blogs are based on personal interest. When you buy a pre published blog / domain, you're buying somebody else's discarded personal interest. Most people who sell blogs do so after learning that what they have won't host ads or get traffic. 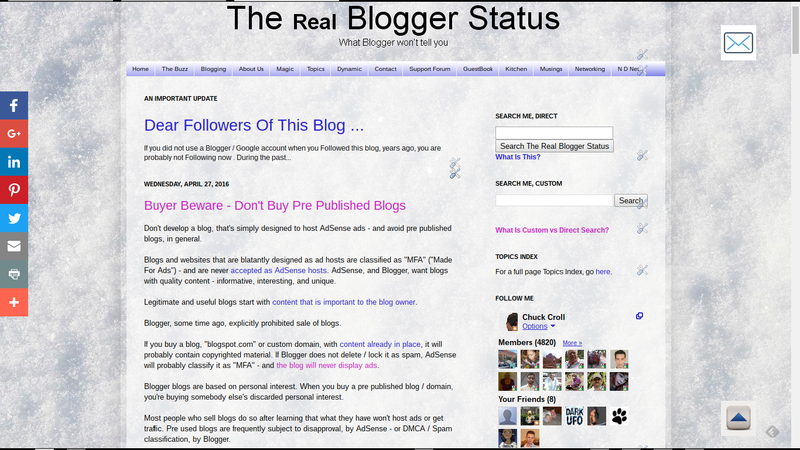 Pre used blogs are frequently subject to disapproval, by AdSense - or DMCA / Spam classification, by Blogger. If you do the research, you'll find out why the previous owner sold it to you. You'll probably end up with a disabled AdSense or Blogger account - and doing the research, you'll find out why the previous owner sold it. It's like a "lemon law" car. If the price seems too good to be true, it probably is just that. You would never, knowingly, buy pre worn underpants. Why would you buy a pre published blog? Start with an available URL, and add your own content. That's how you get content, reputation, and traffic. #Blogger blogs are supposed to be based on personal experience or interest - using content that's informative, interesting, and unique. Purchasing a previously published blog, with content left in place, violates that principle. A smart blog owner starts with an empty blog - using an available URL, and adds content.